Valentine's Day is fast approaching so i thought what better way to celebrate than with a fun little hair tutorial right? I wanted to post it just in time for the weekend because i know many of you may be looking for some 'romantic hair' inspo so here it is! So the thing with this hair style is that it lends itself to many variations... you can skip the braid and create a low side pony or messy bun. 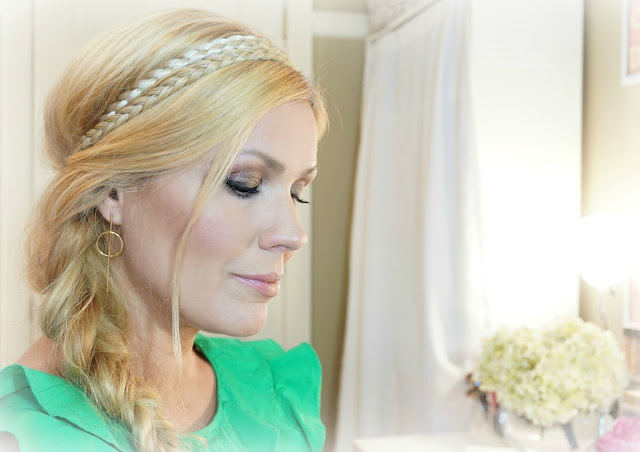 You can also forego the braid headbands and just create the style without them. Another thought? Instead of a braid headband, opt for a beautiful jeweled headband! The possibilities are endless! Whatever way you style your hair this Valentine's Day, just remember to make it a memorable one! For me personally, having children makes Valentine's Day way more special! It's all about them now! We will probably order take-out, bake cupcakes and light up some candles at dinner! I remember growing up, Valentine's Day was perhaps one of my dad's favorite holidays! He ALWAYS cooked up a fancy dinner, decked the table with candles and balloons... the whole nine! Truth is, as awkward as it felt at the time sitting there in candle light with my parents and sister... it was actually quite endearing! I miss those days! The wonderful thing about having my own children now is that i can pass on these sweet little traditions with them! Hope your Valentine's Day is as sweet as you... enjoy! I seriously cannot get over how gorgeous this is. I definitely want to give it a try when I go out this weekend! It's so romantic and beautiful!